They are definitely delicious, but for many people, the taste alone isn’t justification for all the work that goes into selecting, peeling, and eating pomegranates. If the taste doesn’t draw you in, however, there are numerous health benefits that should. Good things are worth working for and the pomegranate is one example of this. Pomegranates are loaded with antioxidants known as polyphenols and, in my opinion, have certainly earned the label “superfood”. They are an excellent source of fiber, vitamin C, B vitamins, vitamin K, and potassium. But of course it doesn’t end there. The pomegranate is one of the earliest cultivated fruits, native to the Middle East and traced back to 3,000 B.C. Their history is as rich as their health benefits, having long represented life, fertility, and health. King Tut and other Egyptians were entombed with pomegranates as it was believed they would carry them into the second life. In Islam, it’s said the fruits were a favorite of the prophet Muhammad. In Christianity, you’ll often see Mary or Jesus holding a pomegranate. From religion to Greek myths and Shakespeare, pomegranates are sprinkled throughout global culture. So, what’s so great about them? 1. 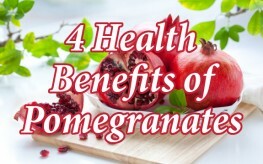 Reduces various risk factors for heart disease – Many studies have linked pomegranate consumption to a healthier heart. The fruits are able to help reduce plaque accumulation in the arteries, reduce oxidative stress, reduce enlargement of the heart, and reduce the amount of proteins associated with inflammation and heart disease – significantly. 2. Improves memory – Researchers found the benefits of pomegranates extend to the brain when they discovered how study participants who consumed pomegranate juice on a regular basis were able to improve verbal memory test scores. These subjects even showed increased brain activity during testing after consuming the juice over a four-week period. 3. Reverses damage to the heart – Spanish scientists found the polyphenols in pomegranates were able to repair damage to the heart by an unhealthy diet. Tested on pigs fed a steady diet of fatty foods, the pomegranate-derived treatment reversed damage to the endothelium. Damage to the endothelium is often a predecessor to atherosclerosis, a risk factor for heart attacks and strokes. 4. Cancer prevention and treatment – One study, from the Breast Cancer Research Program at City of Hope in Duarte, CA, found that phytochemicals from pomegranates are able to inhibit the proliferation of breast cancer cells. Others have suggested pomegranates are similarly able to fight prostate cancer. While pomegranates may be ‘difficult’ to eat, it is well worth the effort as the fruit offers some amazing benefits. Check out our health benefits database to see the health benefits of 60+ foods.